I finished a pattern that would make a perfect Christmas gift exchange gift for a co-worker, or even make a few for yourself. Since it was rejected by knitty, i will unleash it onto the world here. What a great way to use up a bit of your leftover sock yarn! You know how sometimes at work you are pounding down coffee and pretending to get something done, but really you are daydreaming about knitting? This coaster is a way to add a little knitting to your cubicle so you always have a finished object to gaze at. It also makes a cozy home for your coffee or tea mug. Two strands of self-striping sock yarn create a mottled pattern, and the fringe finishes the pattern making it very much like a mini-rug for your mug. 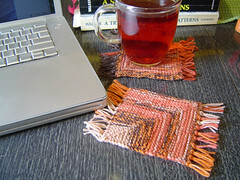 Make a single coaster as gift for a co-worker, or use up all your sock yarn scraps and make a set. One size fits most mugs. 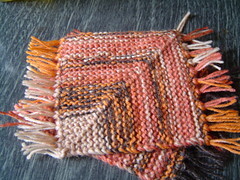 4 inches square (without fringe). Lana Grossa Meilenweit Multiringel [80% wool, 20% polyamide; 420m per 100g skein]; each coaster will use less than 100 m.
This is such a quick project, and useful in so many sizes that it is almost easier to knit a coaster instead of a gauge swatch. This pattern uses two strands of sock yarn held together. If you use self-striping sock yarn and would like to preserve the original striping pattern, divide your yarn into two balls and match up the yarns at a color change. For a mottled effect, you can pull one strand from the outside and one strand from the inside of a center-pull ball. This method effectively reverses the striping pattern of one strand. The shape of the coaster is created by a double decrease at the center of every other row where the center three stitches are decreased to one. The clean edge is the result of slipping the first stitch of every row, and purling the last stitch. Using the long-tail cast on method CO 49 sts. Row 2 and all even rows: sl 1, knit until 1 st remains, p1. Break yarn and pull through the single remaining stitch until tight. Each tassel of fringe is made with two strands of yarn, attached to the edge of the coaster with a crochet hook, and trimmed to an even length. Cut approximately 50 strands of yarn, each about 4.5 inches long. Take two strands held together and fold them in half to make a loop. Insert the crochet hook behind the selvage stitches at the end of the row, and then through the loop you have created. Pull the loop through and leave it on the crochet hook (the ends of the yarn should still be in your hand). Continuing to hold the yarn taut, wrap all of it around the crochet hook and pull it through the loop, attaching it to the edge of the coaster. Pull the strands taught. Repeat this along the side of the coaster. 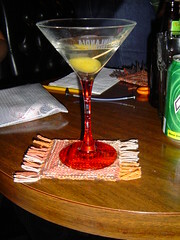 When you have placed fringe on two sides of the coaster, use scissors to trim it to an even length. how nice! i can’t wait to try one. i’m always searching for smart and small gifts to make for my co-workers. i think you may have ended my search for holiday presents! I LOVE those mats, I can’t wait to have a go at them, thanks for posting the pattern (might have to keep them for myself though). cute! was that picture taken at the Mel-o-dee (sigh…)? OMG!!! I absolutely love these!!! That, and your entire blog, BTW. I am a big sock knitter and was wondering a good thing to do with left overs. I found your blog via ScienceKnits. So, what is your affiliation? Just curious…I am a chem grad student, always looking for other science knitters. Thanks for posting your pattern! I really think it’s crazy that this wasn’t published by Knitty! This is so cute. Thanks for sharing your pattern! That\’s really cute. This is a perfect pattern! Just what I was looking for. Would you mind if I direct some knitters your way? There’s a KAL called The Lonesome Skein on Yahoo, and they’re always looking for great one skein projects! Great pattern, it definitely is a great little gift knit! And a nice way to spice up the cubicle hell that is my workspace. What a great idea! Did you just pick a stitch pattern out of a book or how did you pick the design? These are really cute. I was going to give my sock yarn away. Not anymore! Great pattern – can’t imagine why Knitty didn’t snap it up. Sock knitters love patterns to use up the leftovers. I made a ton of baby hats for my 6 week old granddaughter but she won’t need them in a few months. Wonderful pattern! As a new knitter – well, I learned as a child, and picked it up again a few weeks ago after 35 years! – it is briliant to find something like this. Are there any knitters in Ireland out there who would like to correspond? Now, that is cute – thanks so much for sharing the pattern. You maen I have to take up sock knitting – in order to get the leftovers to knit these coasters? Awww. I think these coasters are good enough to stand on their own. I am going to buy sock yarn specifically to knit some of these! I just wanted to tell you that you have THE simplest directions for a mitred square ANYWHERE!!!! I have looked everywhere and all I get is ALGEBRA, or it is all written in abreviations!!! Thank you SOOooooo much now I can Mitre too!!! These are wonderful! I can’t wait to knit some up. Will post to my blog when I do. Thank you! Wow! Is so darling I being looking for one for so long. Do you think I can use 100% cotton, like peach & cream?? where can I buy these mug rugs? I don’t know how to knit! Very Cute!!!! Easy way to use up any odds and ends of any type of yarn…. thank you! i took these to my lunchtime knitting group today, and they loved them. i can’t wait to make more for friends, family, and coworkers. they are fabulous, and SO easy. why didn’t i think of this? but i’m glad you did! thanks! Adorable! Small enough to provide immediate gradification for my attention scattered brain. I love these mug rugs. They are so cute. One question! If I only have size 3 needles how many stitches do I need to cast on to get a 4 inch square. I tried using the 49 stitches but the square is 5inches. Which is too large. I made these for my kids’ teachers as end-of-year thank-you gifts. Thank you so much for sharing the pattern, and especially for encouraging the ‘pull from each end’ technique with the sock yarn; they turned out beautifully!! My friend & I both love the looks of your coaster pattern published in October, 2006. We have a burning question for you. Neither of us has tried the pattern yet, but the directions appear to make a triangle. Are you supposed to make two of these and weave them together to make a square? If not, how does this end up being a square? Hope you can help, and thanks much in advance! I know this is way late but I don’t understand why Knitty would reject it. I love it and am bookmarking it for this summer. They’re lovely! What a fun idea. Adorable! I can’t wait to get started on these tonight. Thank you for sharing!